$dateTime.ToString() + ": Last day of Month:"
$dateTime.ToString() + ": 1.) Run final incremental Backup of this month." #Copy Files to staging folder. $dateTime.ToString() + ": 2.) Copy Files to Tape-Staging-Location"
$elements_vbm = Get-ChildItem -Path $backupFileLocation -filter "*.vbm"
"List of relevant vrb files"
"List of relevant vbk files"
# copy: vbk from today. $dateTime.ToString() + ": First day of month: Running Full Backup this time." $dateTime.ToString() + ": Regular Day of Month: Running Reverse Incremental Backup." Browse other questions tagged backup powershell robocopy veeam or ask your own question. 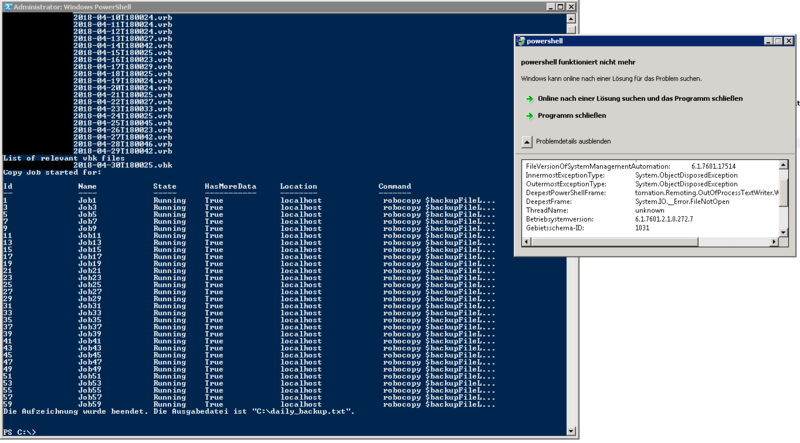 How to get robocopy running in powershell?